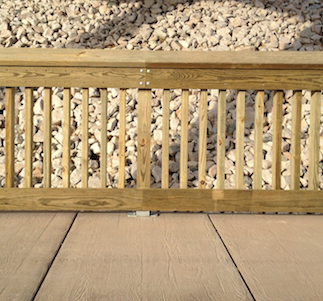 Boardwalk railings are designed per Section 13 of the AASHTO LRFD Bridge Design Specifications. This live load consists of a uniform load of 50 plf and point load of 200 lbs applied per AASHTO. 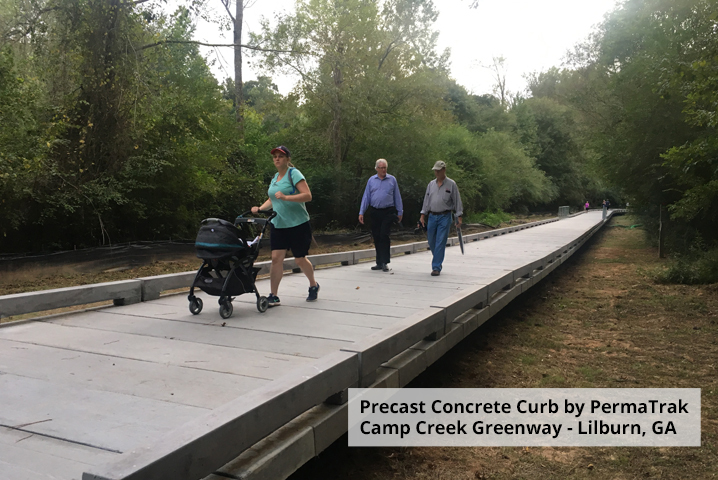 Per the International Building Code, a railing measuring a minimum 42'' from boardwalk surface is required where the boardwalk surface to grade elevation exceeds 30'' (See "Section 3.9.2 - Geometry" in Railings Section of AASHTO LRFD Bridge Design Specifications). This is also in accordance with AASHTO Guide for the Development of Bicycle Facilities. Otherwise, where the grade separation is less than 30'', curbs may be used as a “warning bumper” or “toe curb," although they are not required. Local code requirements for bicyclist applications determine whether the railing needs to be 42'' or 54'' tall. 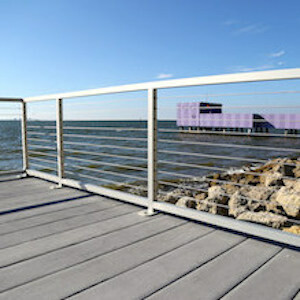 The PermaTrak system allows for a variety of railing options. Railings range from utilitarian timber or simple powder-coated steel to ornamental aesthetic railings. 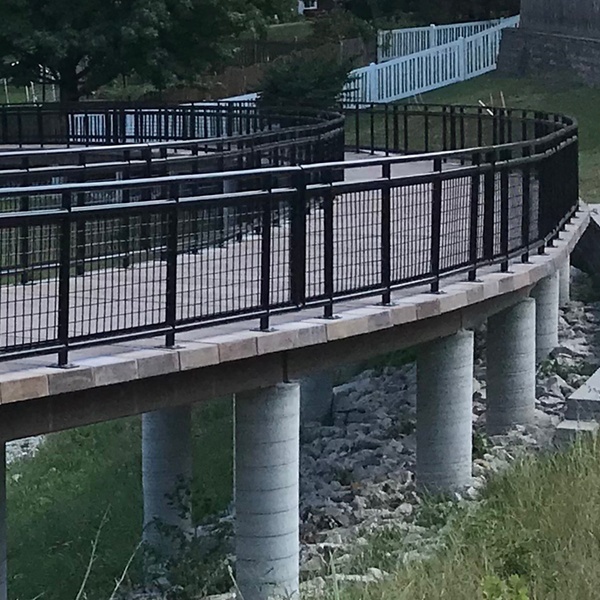 Take a look below for more details on connecting different railing types to a PermaTrak concrete boardwalk. The photos here show a top mounted steel bracket. PermaTrak supplies the bracket and would pre-form holes in the treads where needed so that the contractor does not have to drill in the field. 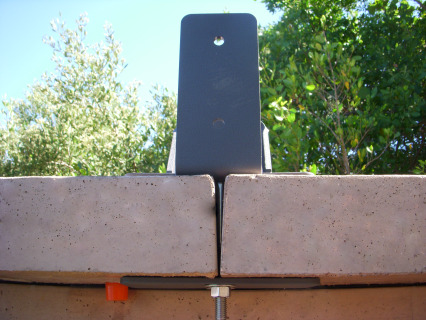 The bracket can be powder coated as shown in the photos or galvanized. There is a minimal cost difference for the upgrade to galvanized steel brackets. This type of connection is used for railing types #1-6 as shown below. Typically, the railings are connected via a threaded bolted connection passing between the treads at the joint. Nut and plates are installed on the underside of the treads. 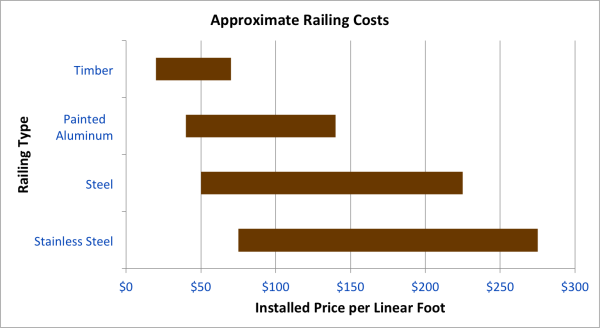 While there is a wide range for boardwalk raiiling materials and specifications, this graph gives a rough breakdown of railing types and their associated installed price ranges. 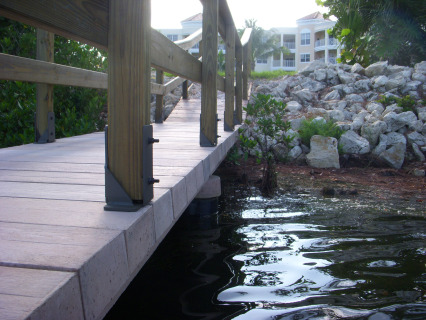 Below are some different railing types we have seen used in conjunction with the PermaTrak boardwalk system. While PermaTrak does not supply these railing and have not created any specifications, we have been involved in many boardwalk designs and have assembled a library of details and specifications from other designers. 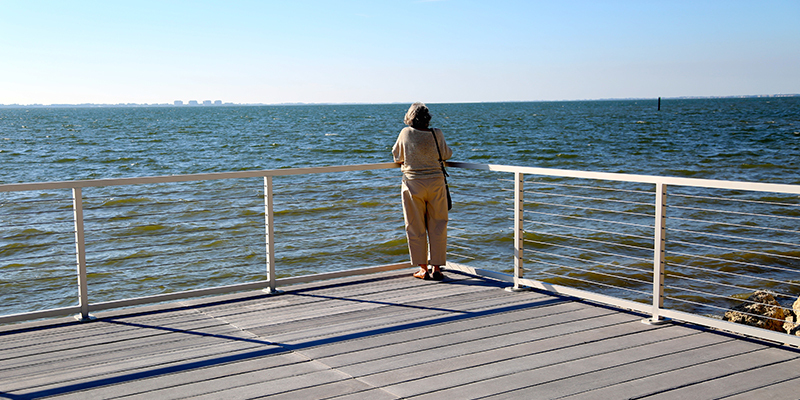 Contact us with your boardwalk railing questions, we're happy to help. 1. 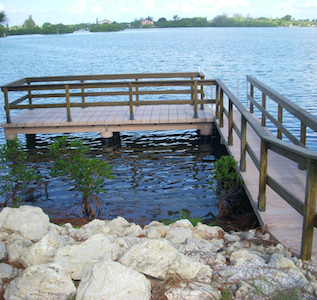 Basic Southern Yellow Pine timber boardwalk railing at Osprey Harbor Observation Deck near Sarasota, FL. 2. 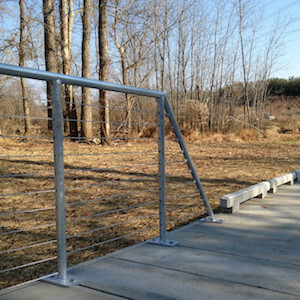 Timber picket style railing at White Oak Greenway in Cary, NC. 3. 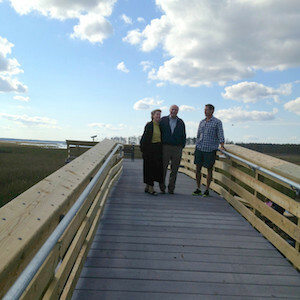 Timber railing with steel grab rail at Blackwater National Wildlife Refuge in Blackwater, MD. See Friends of Blackwater NWR for more information. 4. 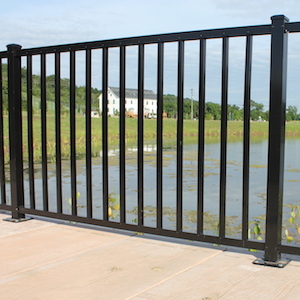 Aluminum railing with wire mesh panels at Spencer Creek in St. Peters, MO. 5. 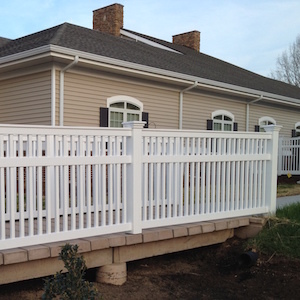 Composite railing at Piedmont Crossing Retirement Community in Thomasville, NC. 6. 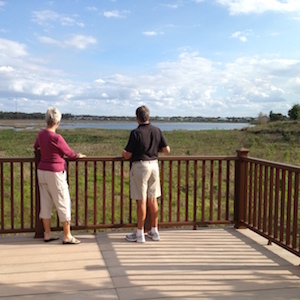 Composite railing at Live Oak Park observation deck - The Villages, FL. 7. 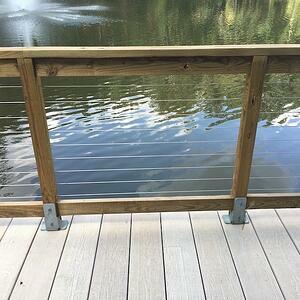 Aluminum picket style railing by SpecRail at Beckett Park wetland boardwalks in West Chester, OH. 8. 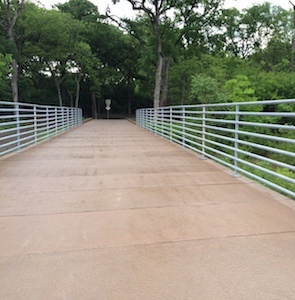 Galvanized steel railing on boardwalk at White Rock Creek Greenbelt Trail in Dallas, TX. 9. Brushed, marine grade aluminum upright posts with stainless steel cable strands at Van Wezel Performing Arts Center in Sarasota, FL. 12. 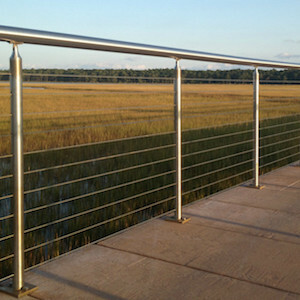 Stainless steel tensioned cable strand railing at Chincoteague National Wildlife Refuge (owned by US Fish and Wildlife) in VA.
As mentioned above, on boardwalk applications where the walking surface is less than 30'' above grade, PermaTrak can supply a precast concrete curb, otherwise referred to as a "toe curb." 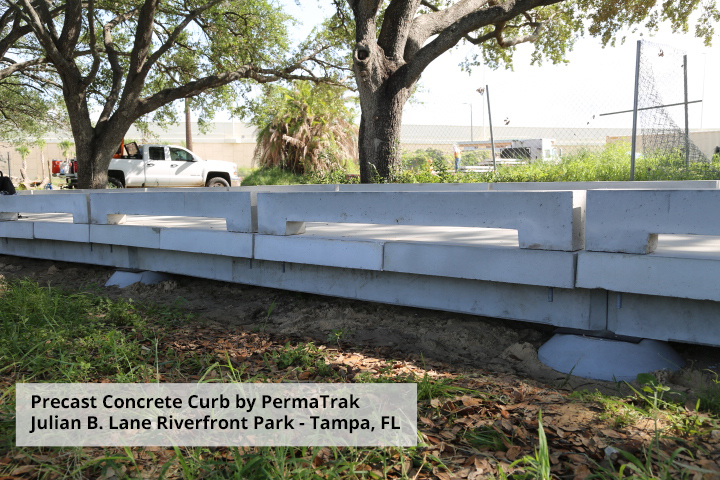 Click to read more about this boardwalk for the City of Tampa.